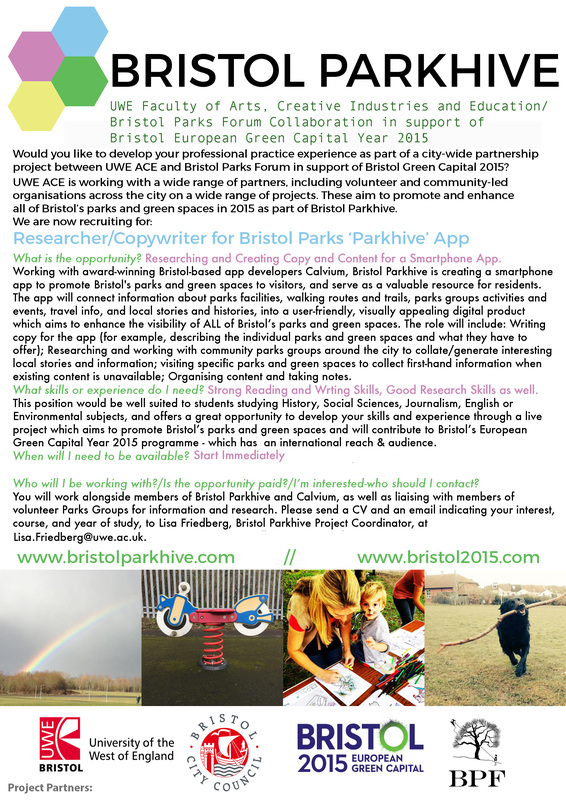 Working with award-winning Bristol-based app developers, Calvium, Bristol Parkhive (a UWE/Bristol Parks Forum collaboration in support of Bristol’s European Green Capital Year 2015) is creating a smartphone app to promote Bristol's parks and green spaces to visitors and serve as a valuable resource for residents. 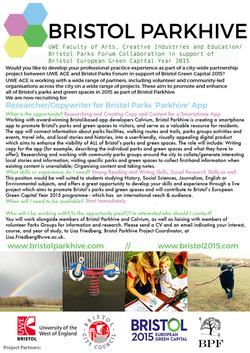 The app will connect information about parks facilities, walking routes and trails, parks groups activities and events, travel info, and local stories and histories, into a user-friendly, visually appealing digital product which aims to enhance the usability and visibility of ALL of Bristol’s parks and green spaces. We are seeking students to help develop the content for the app, by generating and producing content for specific parks and green spaces, writing copy and doing some simple research. The role will include: Writing copy for the app (for example, describing the individual parks and green spaces and what they have to offer); Researching and working with community parks groups around the city to collate/generate interesting local stories and information; visiting specific parks and green spaces to collect first-hand information when existing content is unavailable; Organising content and taking notes. Suited for: This position would be well suited to students studying History, Social Sciences, Journalism, English or Environmental subjects, and offers a great opportunity to develop your skills and experience through a live project which aims to promote Bristol’s parks and green spaces and will contribute to Bristol’s European Green Capital Year 2015 programme - which has an international reach & audience.